Business Week, in keeping with the grand tradition of long-form business publications, took a few thousands words that can be summed up in three words — Facebook killed Myspace. No kidding! I didn’t know that. And while that might be true, it isn’t stopping the social networking giant from being inspired by the hobbled MySpace. Last week I reported that Facebook was close to launching Facebook Music Dashboard, a page that will drive music-centric social activity. The Palo Alto-based giant has teamed up with Spotify (which shares numerous investors with Facebook) and is in talks with other music services. 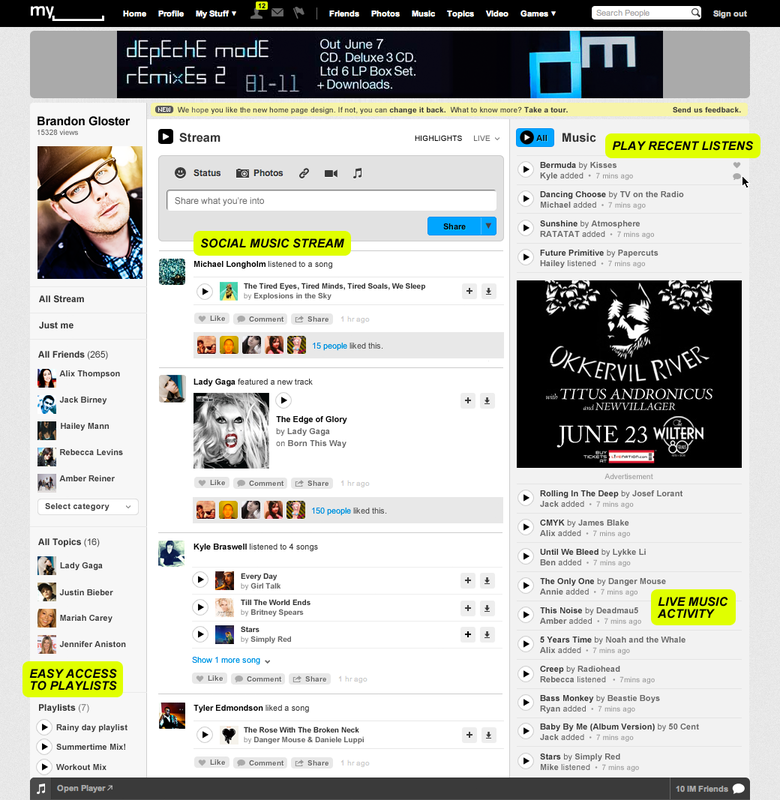 Having seen some of the early mock-ups of Facebook’s Music Dashboard, I couldn’t help but notice the astonishing similarity to Myspace’s new homepage, which is slowly being rolled out to the Myspace community. The bottom navigation bar with the play button is different from Facebook and there is no big giant banner ad on the Facebook page. If you have a minute, go read my post from last week and then peruse these photos. I wouldn’t blame Myspace CEO Mike Jones and his troops for being upset over this new service. Facebook is following Myspace way? So soon? Poor Zuckerberg. I wasn’t aware Facebook were coming out with this. 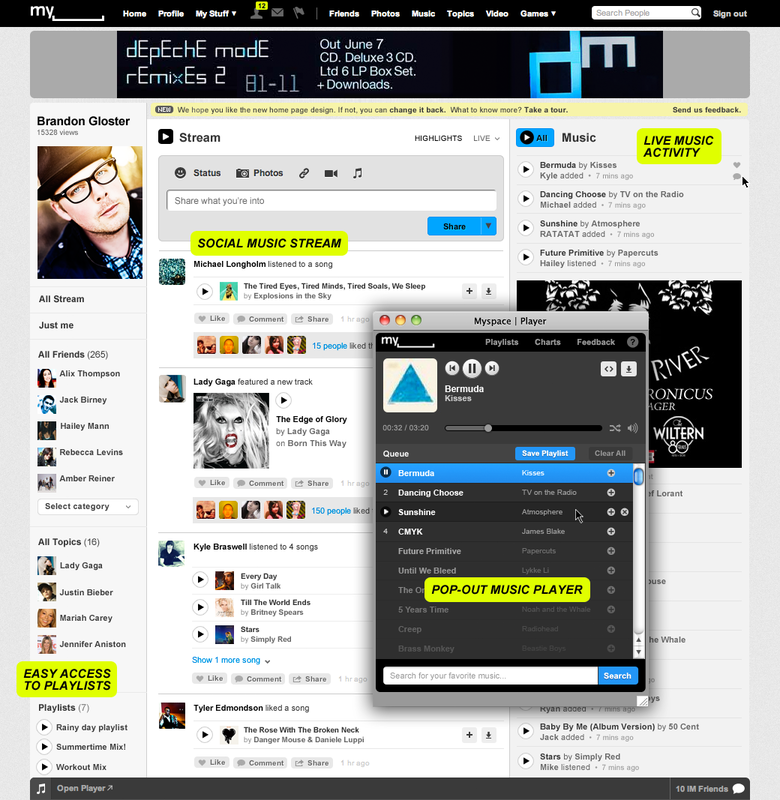 I think the problem with Myspace is that it was too complicating for new users. Facebook is a lot more simple to use. It will be interesting how this will end up!! It will interesting to see how music plays out in the social media space overt he next few years. There are so many complex issues at hand with so many players involved that we will be stuck in what I call “the music mess” for quite some time. Sad but true. Please someone prove me wrong.